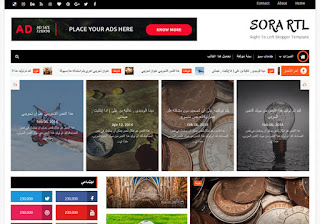 Sora RTL Blogger Template is a feature rich and modern multilingual and RTL Arabic Blogger theme. This theme is best if you want to create a local news magazine website. Minimalist design with plenty customization options can help you set a clean and beautiful blogging platform. Sora RTL has a fully responsive layout. It fits perfectly on various displays and resolutions from regular desktop screens to tablets, iPads, iPhones and small mobile devices.